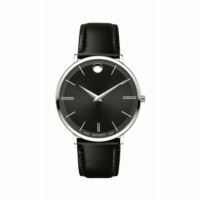 Movado Corporate Exclusive Gents'. Solid Stainless Steel Case And Bracelet. Black Museum Dial. Deployment Clasp. Swiss Quartz Movement. Sapphire Crystal. Water-Resistant To 99 Feet. 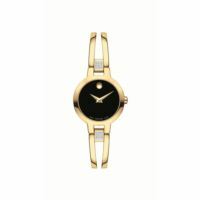 Movado Corporate Exclusive Ladies. 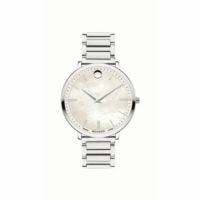 Solid Stainless Steel Case And Bracelet. Black Museum Dial. Deployment Clasp. Swiss Quartz Movement. Sapphire Crystal. Water-Resistant To 99 Feet. 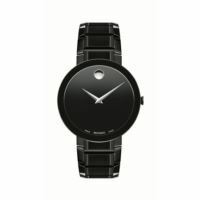 Movado Corporate Exclusive Gents'. 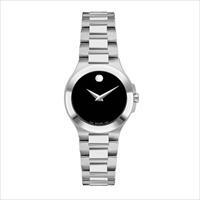 Solid Stainless Steel Case And Bracelet. Silver Museum Dial. Deployment Clasp. Swiss Quartz Movement. Sapphire Crystal. Water-Resistant To 99 Feet. Movado Corporate Exclusive Ladies. 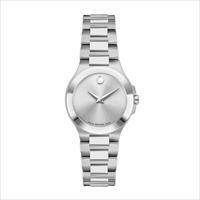 Solid Stainless Steel Case And Bracelet. Silver Museum Dial. Deployment Clasp. Swiss Quartz Movement. Sapphire Crystal. Water-Resistant To 99 Feet. 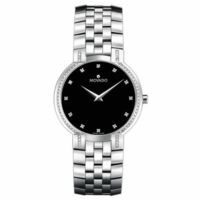 Movado Faceto Mens watch, 38 mm stainless steel case with 74 diamonds, round black dial with silver-toned hands and 12 diamond markers, (0.396 t.c.w. diamonds), stainless steel link bracelet with jewelry buckle, sapphire crystal, Swiss quartz movement, water resistant to 30 meters. 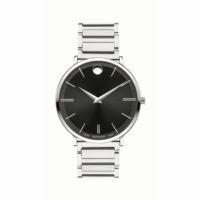 Movado Vizio Mens. 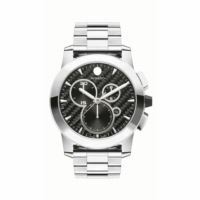 Quartz chronograph, 44.5 mm stainless steel case with tungsten carbide hard metal bezel, round black genuine carbon fiber dial with 3 smooth black timing subdials, silver-toned flat signature dot, luminescent hands and applied cone markers, round date display and white accents, stainless steel link bracelet with push-button deployment clasp, sapphire crystal, Swiss quartz chronograph movement, water resistant to 30 meters. 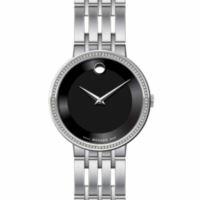 MOVADO Women's Sapphire watch, 28.0 mm stainless steel bezel-free case with flat edge-to-edge sapphire crystal, round silver mirror dial with 11 diamond markers (0.042 t.c.w. 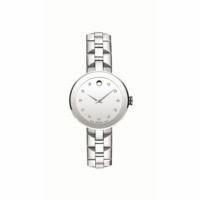 ), silver-toned signature dot and hands, stainless steel pyramid-shaped link bracelet with butterfly deployment clasp, Swiss quartz movement, water resistant to 30 meters..
Women's Esperanza watch, 28 mm stainless steel case with 63-diamond bezel (0.245 t.c.w. 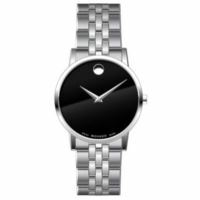 ), matte black Museum dial with raised lacquer-finish outer ring, and silver-toned dot and hands, stainless steel free-falling bracelet design with signature open vertical links and push-button deployment clasp. Men's Esperanza watch, 39 mm yellow gold PVD-finished stainless steel case, matte black Museum dial with raised lacquer-finish outer ring, and gold-toned dot and hands, yellow gold PVD-finished stainless steel free-falling bracelet design with signature open vertical links and push-button deployment clasp. 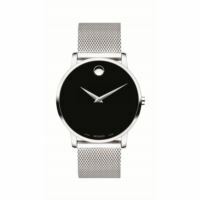 Men's Movado Ultra Slim watch, 40 mm stainless steel case, 6.3 mm deep; black CD-cut dial with fine concentric-circles texture, silver-toned signature dot and thin applied stick markers; black calfskin strap with matching top-stitching and stainless steel classic tongue buckle. Men's Movado Ultra Slim watch, 40 mm yellow gold PVD-finished stainless steel case, 6.3 mm deep; black CD-cut dial with fine concentric-circles texture, yellow gold-toned signature dot and thin applied stick markers; black calfskin strap with matching top-stitching and yellow gold PVD-finished stainless steel classic tongue buckle. 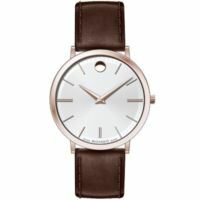 Men's Movado Ultra Slim watch, 40 mm Rose gold PVD-finished stainless steel case, 6.3 mm deep; silver/white CD-cut dial with fine concentric-circles texture, rose gold-toned signature dot and thin applied stick markers; brown calfskin strap with matching top-stitching and yellow gold PVD-finished stainless steel classic tongue buckle. 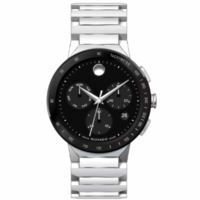 Men's Modern Classic quartz watch, 39.2 mm stainless steel case, black Museum dial with tone-on-tone outer ring and silver-toned dot and hands, stainless steel link bracelet with push-button deployment clasp. Sapphire Crystal. 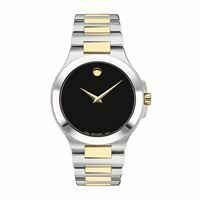 Men's Modern Classic quartz watch, 39.2 mm stainless steel and yellow gold PVD-finished case, black Museum dial with tone-on-tone outer ring and yellow gold-toned dot and hands, stainless steel and yellow gold PVD-finished link bracelet with push-button deployment clasp. 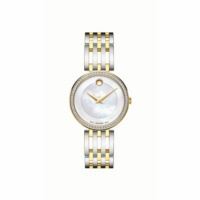 Women's Aleena watch, 27 mm stainless steel case, stainless steel dial with yellow gold PVD-finished inner circle, with yellow gold-toned dot and hands, stainless steel and yellow gold PVD-finished bangle-style bracelet with jewelry clasp. 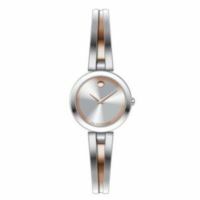 Women's Aleena watch, 27 mm stainless steel case, stainless steel dial with Rose gold PVD-finished inner circle, with rose gold-toned dot and hands, stainless steel and rose gold PVD-finished bangle-style bracelet with jewelry clasp. Women's Amorosa watch, 24 mm stainless steel case, black Museum dial with silver-toned dot and hands, stainless steel double-bar bangle-style bracelet with back sizing links and jewelry clasp. 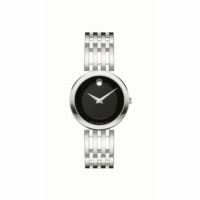 Women's Amorosa watch, 24 mm stainless steel case, black Museum dial with silver-toned dot and hands, stainless steel double-bar bangle-style bracelet with 18 diamonds (0.070 t.c.w. ), back sizing links and jewelry clasp. Men's Movado Ultra Slim watch, 40 mm stainless steel case, 6.3 mm deep; black CD-cut dial with fine concentric-circles texture, silver-toned signature dot and thin applied stick markers; stainless steel bracelet with push-button deployment clasp. Men's Movado Ultra Slim watch, 40 mm stainless steel case, 6.3 mm deep; blue CD-cut dial with fine concentric-circles texture, silver-toned signature dot and thin applied stick markers; stainless steel bracelet with push-button deployment clasp. Women's Movado Ultra Slim watch, 35 mm stainless steel case, 6.3 mm deep; white mother of pearl dial, silver-toned signature dot and thin applied stick markers; stainless steel bracelet with push-button deployment clasp. 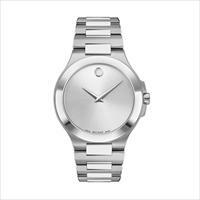 Men's Sapphire watch, 39 mm stainless steel bezel-free case with flat edge-to-edge metalized sapphire crystal, silver mirror Museum dial with silver-toned dot and hands, stainless steel link bracelet with push-button deployment clasp. 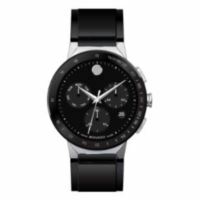 Men's Sapphire watch, 39 mm black PVD-finished stainless steel bezel-free case with flat edge-to-edge dark metalized sapphire crystal, black Museum dial with silver-toned dot and hands, black PVD-finished stainless steel link bracelet with push-button deployment clasp. Men's Sapphire watch, 39 mm yellow gold PVD-finished stainless steel bezel-free case with flat edge-to-edge dark metalized sapphire crystal, gold-toned Museum dial with gold-toned dot and hands, yellow gold PVD-finished stainless steel link bracelet with push-button deployment clasp. Movado Esperanza Gentes watch, 39 mm stainless steel and yellow gold PVD-finished case, round black dial with 11 diamond markers (0.043 t.c.w.) and yellow gold-toned dot and hands, stainless steel and yellow gold PVD-finished free-falling bracelet design with signature open vertical links and push-button deployment clasp. 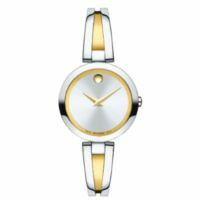 Movado Women'S Sapphire Watch. 28 Mm Stainless Steel Bezel-Free Case With Flat Edge-To-Edge Sapphire Crystal And 36 North/South Diamond Accents, Round Silver Mirror Dial With 11 Diamond Markers, Silver-Toned Dot And Hands, (0.183 T.C.W. Diamonds), Stainless Steel Pyramid-Shaped Link Bracelet With Butterfly Deployment Clasp. 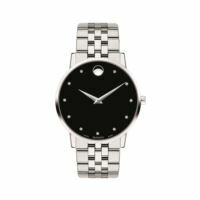 Museum Classic Gents watch, 40 mm stainless steel case, black Museum dial with silver-toned dot and hands, stainless steel link bracelet with push-button deployment clasp. Museum Classic Gents watch, 40 mm stainless steel and yellow gold PVD-finished case, black Museum dial with yellow gold-toned dot and hands, stainless steel and yellow gold PVD-finished link bracelet with push-button deployment clasp..
Museum Classic Gents. 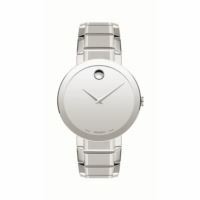 40 mm stainless steel case. black dial with 11 diamond markers (0.043 t.c.w.) and silver-toned dot and hands, stainless steel link bracelet with deployment clasp. 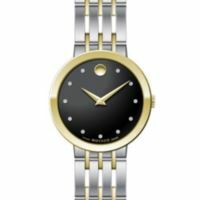 Museum Classic Gents watch, 40 mm yellow gold PVD-finished stainless steel case, round black dial with 11 diamond markers (0.043 t.c.w.) and yellow gold-toned dot and hands, stainless steel and yellow gold PVD-finished link bracelet with push-button deployment clasp. Museum Classic Mens watch, 40 mm yellow gold PVD-finished stainless steel case, black Museum dial with gold-toned dot and hands, yellow gold PVD-finished stainless steel link bracelet with push-button deployment clasp. Women's Museum Classic watch, 28 mm stainless steel case, round black lacquer dial with 11 diamond markers (0.043 t.c.w.) and silver-toned dot and hands, stainless steel link bracelet with deployment clasp. 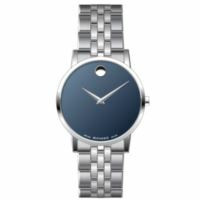 Museum Classic watch Gents, 40 mm stainless steel case, blue Museum dial with silver-toned dot and hands, stainless steel link bracelet with push-button deployment clasp. Women's Museum Classic watch, 28 mm stainless steel case, black Museum dial and silver-toned dot and hands, stainless steel mesh bracelet with sliding closure clasp. Movado Esperanza Gents watch, 39 mm stainless steel case with 94-diamond bezel (0.367 t.c.w. 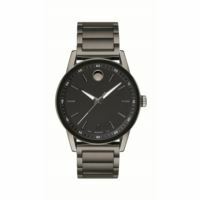 ), matte black Museum dial with glossy tone-on-tone outer ring, and silver-toned dot and hands, stainless steel free-falling bracelet design with signature open vertical links and push-button deployment clasp. Movado Sapphire Gents chronograph watch, 43 mm black PVD-finished and stainless steel case with flat edge-to-edge sapphire crystal, round black dial with 3subdials, silver-toned dot with matching hands/indices, date window, stainless steel link bracelet with push-button deployment clasp.